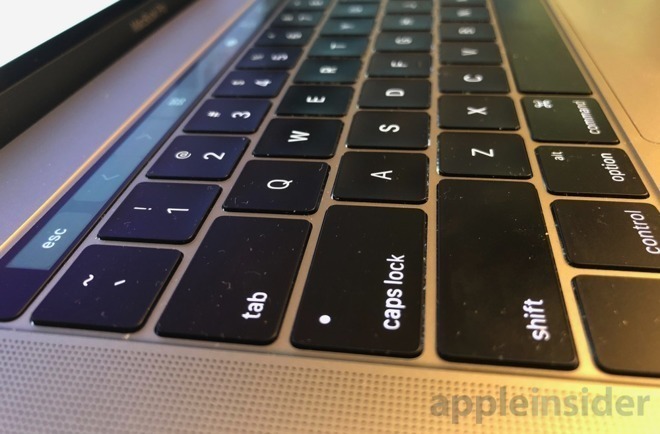 Apple is continuing to work on ways to revolutionize the keyboard used in its MacBook ranges, including a virtual keyboard that can change depending on what the user requires at that moment, and a method to make a keyboard practically impervious to dust and debris. A trio of patent applications published by the U.S. Patent and Trademark Office on Thursday were filed by Apple on March 28. 2018. All three filings share the same name of "Device having integrated interface system" and a similar list of inventors, along with discussing how to improve the MacBook keyboard experience in connected ways. Across the board, the filings discuss the use of a main body enclosure for a MacBook that has a transparent top where the keyboard resides, produced from a clear material such as plastic or glass. Underneath the transparent layer are a number of embedded sensors that could detect where a user's fingers are touching the surface, and how much force is applied. The same section could also include a display that can illuminate the keyboard from below, adding glyphs to keys depending on the selected language, or other symbols based on the user's work. In some cases, such as with a completely flat keyboard surface, this could also be used to produce a virtual keyboard with a user-configurable layout, and even one with unusual software buttons and other controls that would not usually appear on a keyboard, like sliders and dials. In some cases where a physical keyboard is included, the system could allow for the keys and surrounding areas of the housing to be touch sensitive, so gestures could be performed by lightly swiping the key caps, rather than resorting to the trackpad. The touch sensitive nature of the surrounding housing could be used in a similar way, or even with accessories placed on top of the surface, like a joystick. Haptic feedback could be provided to the user, offering some level of tactile feeling to a flat surface, advising that a key had been pressed. 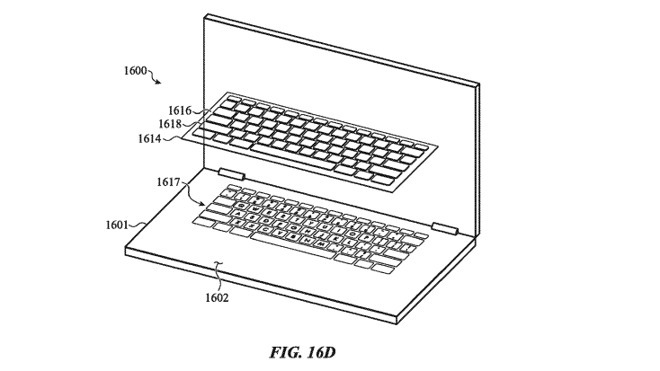 For one version with a completely flat surface, Apple envisions a "keyboard" accessory that can be placed on top of the relevant section of the lower housing, providing users with keys and a proper tactile experience, while still relying on the housing to detect key presses. Another version features a version that is closer to current keyboard mechanisms, with a keyboard section placed in a recess to stay as flat as possible in line with the rest of the housing. A flexible "fabric cover" that could be made of "watertight" or "sealed" materials would be included as a membrane, placed on top of the keyboard mechanism, covering them entirely. The material would be flexible enough for the key mechanism to actuate the key, without requiring a hole to be made in the membrane at all. The 2018 MacBook Pro models have an added membrane which seems to have been made with reducing debris buildup in mind, but its holes to allow for key actuation means it is not infallible. One filing suggests the keycap could be affixed to the portion of the cover that overlies the keycap support, or sandwiching the cover between the keycap support and the keycap. By doing so, this would create a "substantially continuous, unbroken cover" that would keep the keyboard sealed and protected. 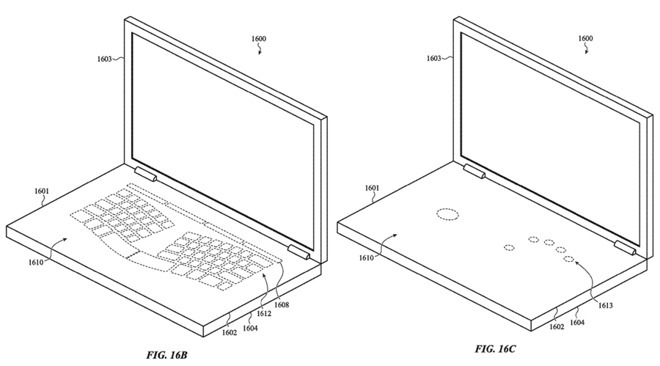 This is far from the first time Apple has filed patent applications that introduce concepts that could majorly change the way users interact with their notebooks. 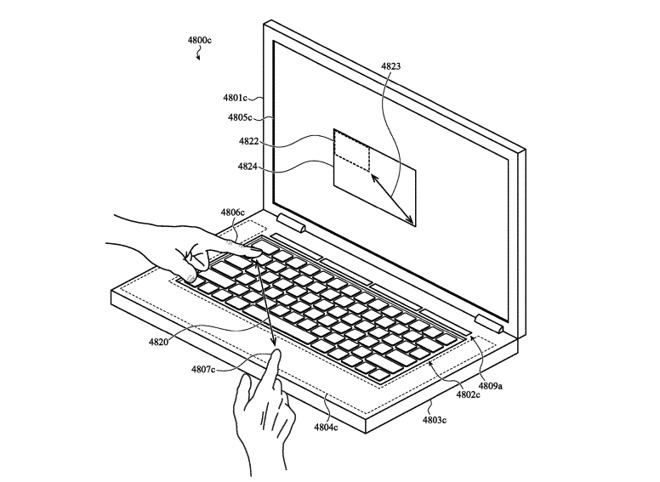 A March 2018 patent application for a "Keyless keyboard" discussed the idea of using a virtual keyboard, while a patent granted in February 2018 for a dual display notebook proposed using a screen as an input area. Apple is known for filing large numbers of patent applications for potential products, many of which do not end up being used in consumer products. An idea's appearance in a USPTO filing is not a guarantee that Apple will continue developing the concept for commercial release.